New products, hot trends and cool surprises – TomTom’s stand at the ISPO fair offered all three of these simultaneously. But more than anything else, it offered a taste of what’s to come: increasingly intelligent travel assistants for sporty performance. And a cool competition was included too. When the global market leader in navigation devices moves into the world of sport, there is the promise of pure dynamism. And when the focus is also placed on GPS-based sports watches, things really begin to get going. Not just people, but the visitors too. And sales. This is precisely what happened at ISPO 2017 in Munich – the world’s biggest sports fair, boasting some 80,000 visitors. Appealing to an international audience in this setting, which is a hive of activity, is the master discipline of any trade fair concept. A product presentation that grabs people in a matter of seconds and that delivers what it promises when put to the test. A brand world that’s easy to recognise and that people will remember for a long time. An experience realm that gives visitors a ‘wow’ moment and secures major customers in the long term. A 100-square-metre pitch, four product worlds and never-ending adventure. How can a playing field measuring 100 square metres ideally be used? What was needed were product displays and rooms that encouraged communication. And it was important that TomTom’s clear corporate design be drawn upon while also incorporating the dynamism of the world of sport. Stand architecture that encapsulated not only technical expertise, but also the sporty spirit of active people. People with a goal, for which TomTom offers just the right support. People for whom the motto ‘Get Going’ stands for a never-ending adventure. How did we achieve this? With a sophisticated look in a warm atmosphere. With distinct zones set in bright light. With natural materials such as grass and wood, flowing lines and skewed perspectives. And with a truly cool competition: three Adventurer watches frozen in a block of ice. How long will it take for the ice to melt? It wasn’t just the Facebook community that was impressed – it was a convincing trade fair concept that worked. 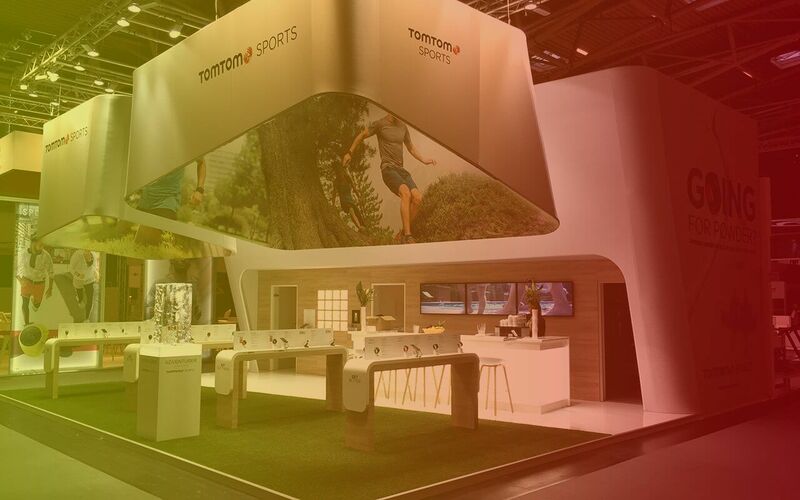 The visitors, clients and professional circles all agreed: the TomTom stand at ISPO 2017 was simply cool!